The fresh flavors of this pasta dish can be served warm or chilled. Garnish with crumbled feta cheese if desired. Cook pasta according to package instructions. Drain pasta, reserving 1/2 cup of pasta water. 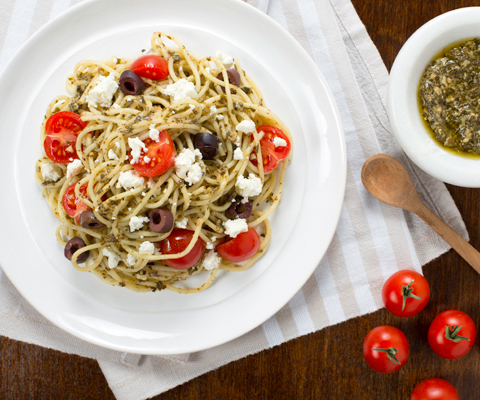 In a large bowl, combine cooked pasta, reserved pasta water, Pesto Sauce, tomatoes and olives, and toss until well mixed, adding more pasta water if needed to reach desired consistency. Serve warm or chilled. Garnish with crumbled feta cheese if desired. Just as delicious with Classico Sun-Dried Tomato Pesto Sauce & Spread. Serve with freshly grated Parmesan cheese, if desired. This is my favorite Classico Sauce! It's delicious and can be used to create so many dishes.